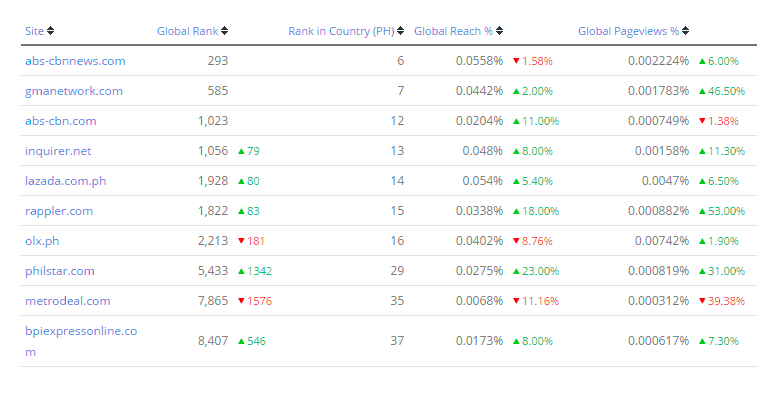 MANILA, Philippines - Broadcast giant ABS-CBN dominated the list of the most popular websites in the country based on Alexa’s latest rankings as more and more Filipinos visit the site to get news and information about the network’s stars and programs. ABS-CBN’s news site abs-cbnnews.com remains to be the most viewed online site in the country at number one spot. Meanwhile, GMANetwork.com placed second ahead of local online news sites Inquirer.net and Rappler. ABS-CBN.com has risen to the third spot from the 30th spot, in just two years. Alexa is a website that runs analytics for internet traffic and monitors website traffic and interaction. Another highlight for ABS-CBN Entertainment’s online portal is its YouTube channel, ABS-CBN Entertainment, which has breached the 2 billion view-mark, the highest in the Philippines. It also boasts the biggest subscriber base in the country of over 2 million. This puts the channel ahead of Kids’ Toys, which is now part of ABS-CBN’s Chicken Pork Adobo multi-channel network, which ranks second, and ABS-CBNNews.com, which ranks third. “Our YouTube channel has become a significant revenue contributor for online. We have reached rank 17 in global ranking, with 58 million views for just one week. Worthy to note though that last year, the average views hover in the vicinity of 10-12 million a week, compared to this year’s high of 58 million views a week. This gives us an indication of the shifting media consumption and behavior of our audiences,” said Richard Reynante, head of ABS-CBN digital content publishing. Aside from that, the Kapamilya network’s Facebook page (ABS-CBN) also continues to have the strongest following and community in the media category in the country, hitting 11 million Likes and reaching out to more than 24 million people on the social media network. The numbers, data, and rankings continue to prove that the Kapamilya online community, with the help of its subscribers, followers, and fans, continue to be strong in the online entertainment category. Visit the various ABS-CBN online sites which collectively rake more than 2 billion views a year that includes ABS-CBN.com, ABS-CBN News (abs-cbnnews.com), ABS-CBN Star Cinema (starcinema.com.ph), ABS-CBN Sports (sports.abs-cbn.com), ABS-CBN Star Music (starmusic.ph), Myx (myxph.com), Choose Philippines (choosephilippines.com), ABS-CBN Lifestyle (lifestyle.abs-cbn.com), and Push.com (push.com.ph) for more information and news about your favorite Kapamilya show and celebrities.